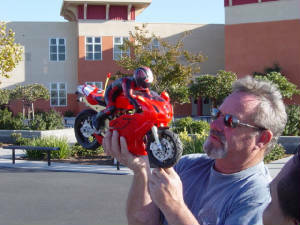 Radio Control Motorcycles Club of California R.C.M.C.C. After a few roundabout phone calls Saturday night, we decided to meet Sunday at the Union City schoolyard to casually run the bikes. In attendance were Ken, Sam, Ian, and Kevin of the club. 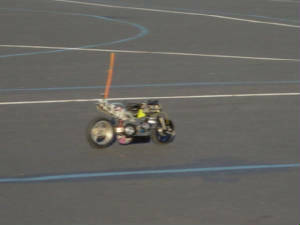 First, a highly technical touring car track was setup with a few cones and Frisbees and laps were timed for the Kyosho brushless HOR, Kyosho direct steering static, and Tamiya F201 F1 car, garnering 24.48s, 23.63s, and 17.96s laptimes respectively. Hey, bikes lap pretty comparable times to touring cars! Also note that the static bike laps about a second quicker than the HOR due to direct steering and the lighter weight of the chassis. 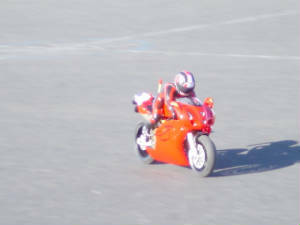 Next up were Ken’s new TT Ducati 999 and Kevin’s TT Nitro conversion. 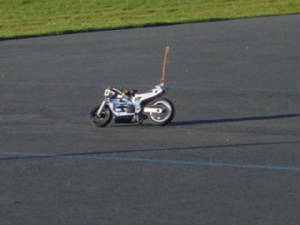 The Duc, with a Lehner brushless motor system as the only upgrade, ran beautifully out of the box. 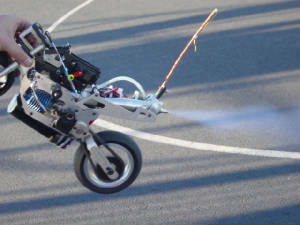 Any doubt about this dual silicone rod steering system was quickly put to rest after the bike was tried out by the crew. Kevin’s TT Nitro, after a few teething problems with a flooded engine and loose steering head bolts, ran great in the open yard. The smell of the nitro and sight of the smoke trail was awe-inspiring. 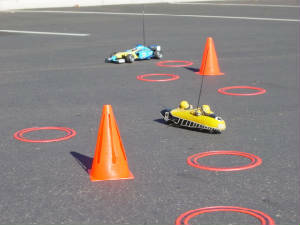 With an hour remaining before dusk, the cones and Frisbees were rearranged to a large 1/5th scale backwards “L” configuration pictured below, starting with a main straight going into a fast left hander. A couple more lefts in the back field and a slightly downhill corkscrew ended with a hairpin back into the main straight. Kevin and Ian, with identical Novak systems and 15T/26T gearing, tackled this one with Sam as the DVD cameraman. Evenly matched speed made for great DRAFTING opportunities going into the fast lefthander. Inside line was the key, but only if you held it. Otherwise late-braking any mistake would let the other room to pass. 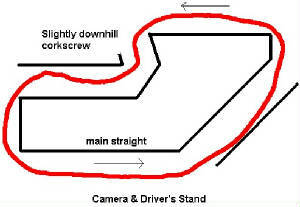 The corkscrew also created many passing opportunities, as well as the last hairpin. 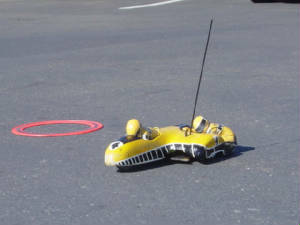 Three battery packs each and only two crashes per person (WOW) made for some really great DVD footage. If only we could post it? ?